I came across this gorgeous illustration on Tumblr--it was originally posted by Vanitas, though I stumbled on it via Scientific Illustration (a really great place to find very, very cool pictures for those of us who like our art with a dose of science). 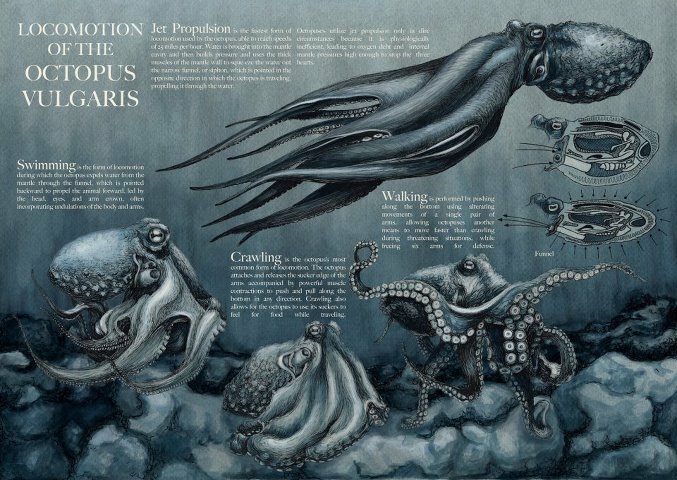 The only information provided is that it's by Katy Wiedemann, titled "Locomotion of the Octopus vulgaris," and is an illustration for the Narragansett Bay Audubon Society. Further poking about suggests it's probably by this Katy Wiedemann, a student at Rhode Island School of Design, who is also styrofoam-SKELLETON on deviantArt (though that particular illustration isn't included in either of her online portfolios). Kickstarter is a crowd-source funding website, full of interesting things people would like to do and make. Barry Williams would like to make resin octopi for you, and has started this Kickstarter project to help. Good luck Barry!